According to a new report by Kelley Blue Book, recalls of vehicles containing defective Takata airbags impact approximately 1 out of every 8 vehicles on our nation’s roads. However, this report also found that 33% of individuals surveyed were unsure whether their car was part of the recall. To date, more than 32 million vehicles in the United States have been recalled due to safety issues associated with defective Takata airbags. In the event of an auto accident, the chemical propellant that inflates the airbag may explode with too much force, causing the airbag to rupture and shoot shrapnel towards vehicle occupants. 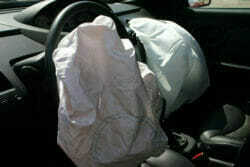 There have been 10 fatalities and over 100 injuries reported across the United States as a result of these dangerous airbags. If your vehicle is equipped with a defective Takata airbag and you do not participate in the recall, your safety may be at risk during an auto accident. You can find out additional information about the recall by visiting safercar.gov. If your car is included in the recall, contact your local dealer to schedule a time to repair the issue. The auto accident attorneys at McWhirter, Bellinger & Associates, P.A. have been fighting for the rights of injured victims in the Columbia, South Carolina area for over 40 years. We have the resources and experience necessary to battle the high powered legal teams employed by negligent vehicle manufacturers. If you’ve been injured by a defective Takata airbag, we will fight aggressively to help you recover the compensation you deserve. Please contact McWhirter, Bellinger & Associates, P.A. using the form on this page or call (888) 353-5513 today to schedule a free auto accident consultation. We serve clients in Columbia, Camden, Sumter, Lexington, Newberry, Orangeburg, Aiken and throughout South Carolina.